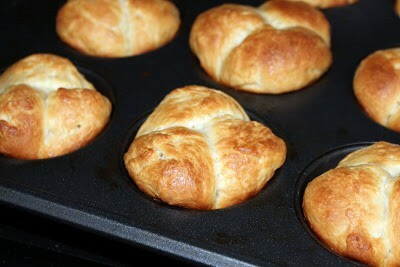 This week I am doing shaped and yeasted breads/rolls and the first one I chose is this cloverleaf shaped dinner rolls. I have never worked with ‘No Knead’ bread recipes and this is my first trial with it. Personally I just love the feel of the dough in my hands when I am kneading them. But, I got to admit though that is not for my Kitchen Aid stand mixer; I would not be saying this. The machine does most of my kneading and I just do the final few punches with my hands to get the feel of how the dough is when it’s ready to rise. 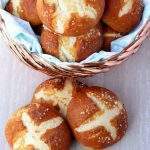 This recipe was very simple to put together and I also let the dough sit in the refrigerator for a day before I made the rolls. 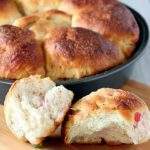 This dough can be made couple of days ahead and refrigerated. 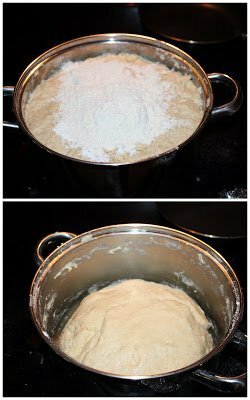 Just make sure that you leave the dough out for couple of hours before shaping the dough. I only have one large muffin pan that could make 12 muffins. 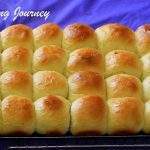 So I made 12 rolls in the cloverleaf shape and the remaining, I just shaped as regular rolls. 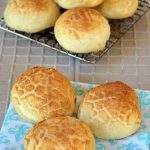 This dough is very basic and can be for any kind of rolls. 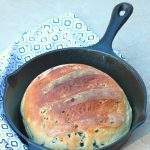 I still have not made any loaf bread with this recipe but plan on trying one soon. 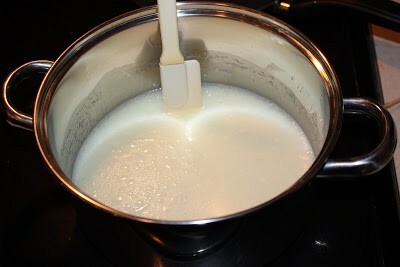 In a large pot add the milk, sugar and vegetable oil and let it just come to a boil. Just before the mixture is coming to a boil, turn off the flame and let this cool down to lukewarm temperature. The mixture should still be warm when you touch it, but not too hot to kill the yeast. To this add 2 cups of flour and the yeast and mix well. The mixture will now look like a thick batter. Now add 2 more cups of flour and mix with a wooden ladle. At this stage the mixture will still be very sticky. Cover the pot with kitchen towel and let it sit in a warm place for about an hour or until it is doubled in volume. 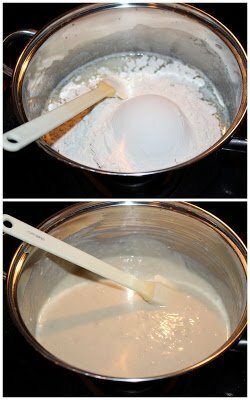 Now add the remaining ½ cup of flour along with baking powder, baking soda and salt and mix well with the ladle. At this stage, I did knead the dough a little to help incorporate the ingredients well. It was hard to stir using a ladle. 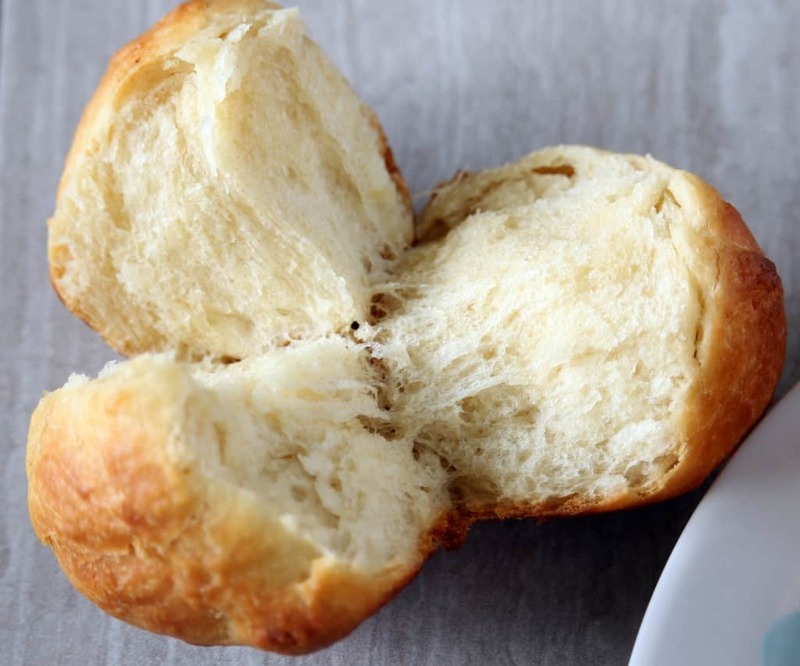 We can make the rolls now or if making them later, refrigerate at this stage. 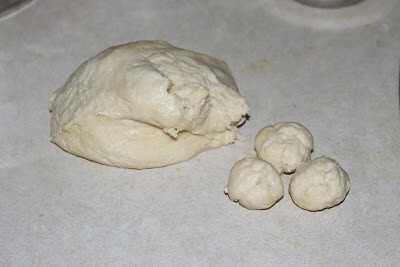 If making it at a later time, make sure you bring the dough back to room temperature before shaping them. I made the dough a day before and refrigerated it. Then I left it out for couple of hours before shaping. The dough was still rising inside the refrigerator and I had to punch it down once as it was up to the top of the pot. 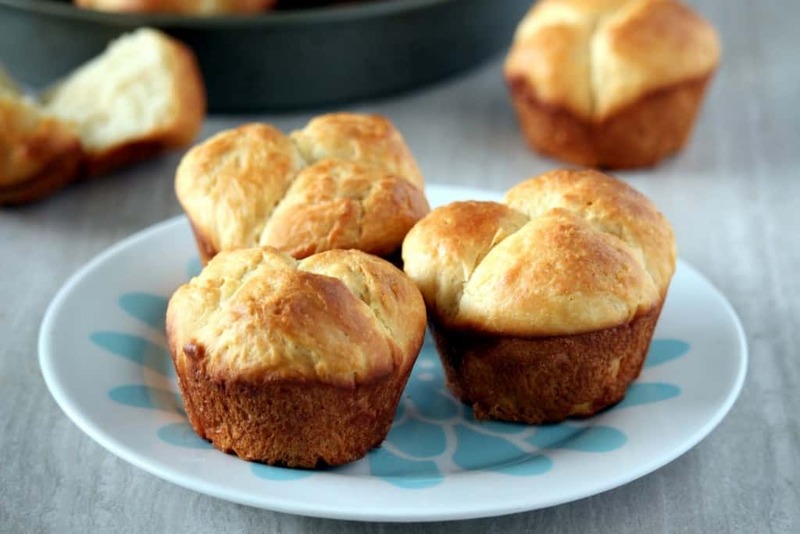 Grease the large muffin pan liberally with butter. Pinch very small ping pong size pieces out of the dough and shape it into a rough ball. 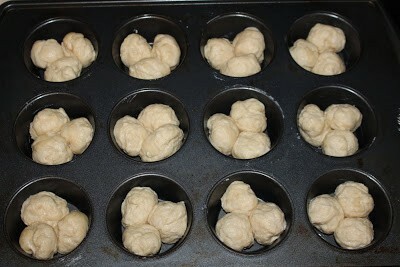 Place 3 balls in each muffin hole. 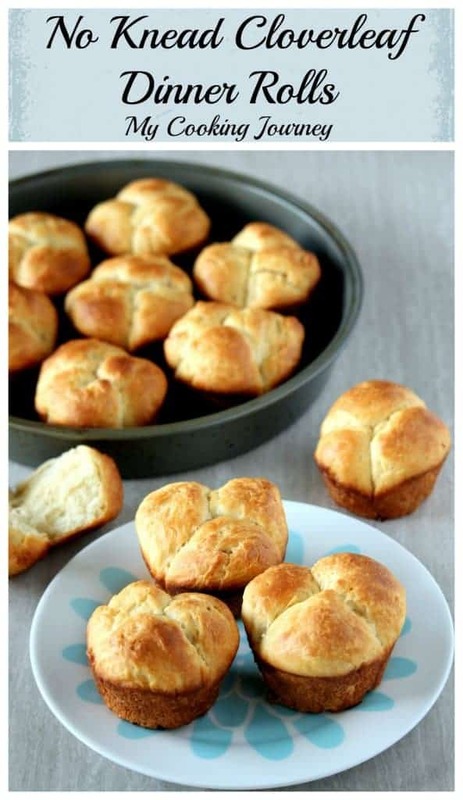 Repeat until you have used up all the dough. Cover the tray and let it rise until the dough has risen well. I left them to rise for about 1 ½ hours and by then they rose over the rim of the muffin hole. 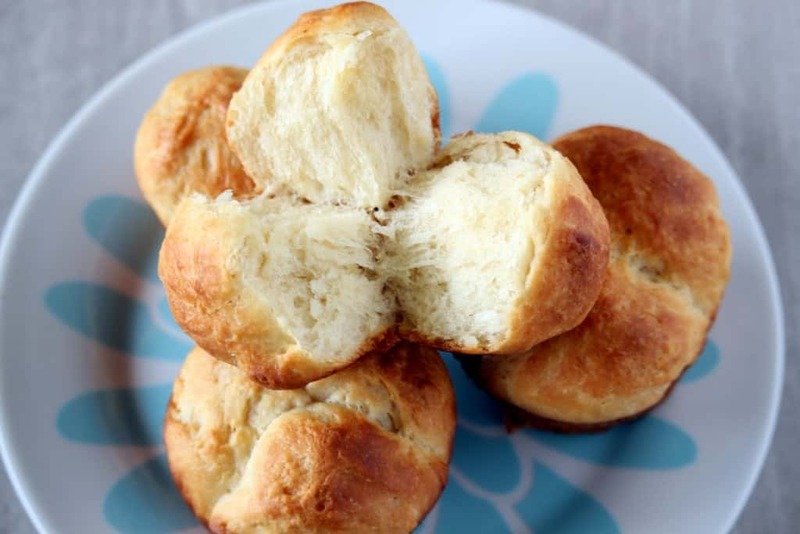 Brush the rolls liberally with a mixture of milk and butter or cream. 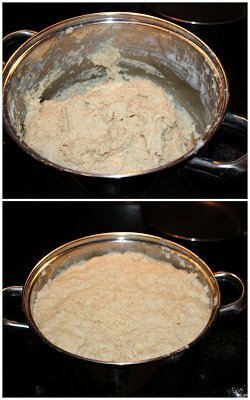 I use about 2 tsp of butter and 2 tbsp of milk and warm them to mix well. 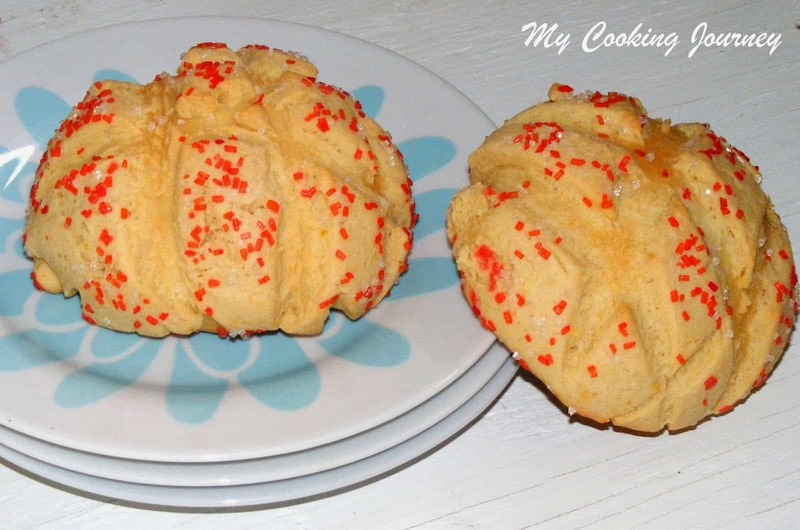 This mixture helps in giving a nice color to the rolls when compared to just the milk. I am assuming the bit of fat helps in the color development. 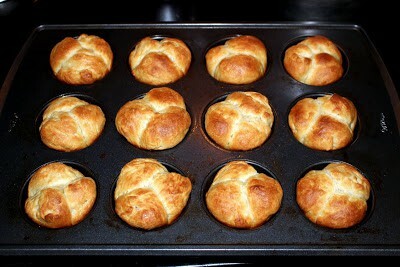 Preheat the oven to 400 F and bake the rolls for about 17 to 20 minutes. Mine baked at about 17 minutes. Let them sit in the pan for about 10 minutes and then loosen them gently from the pan and serve warm with butter. It was just so much fun to pull apart the clover leaf and eat! 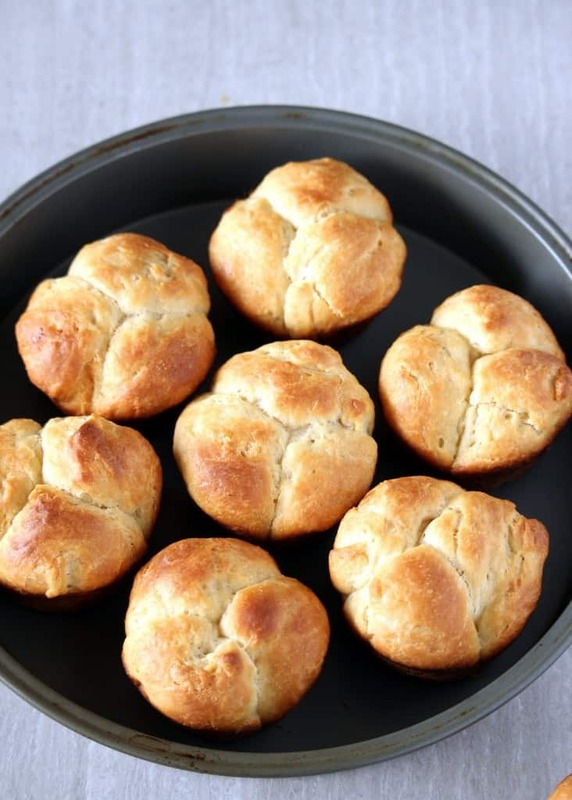 Can you believe that I don’t have a recipe for dinner rolls yet? 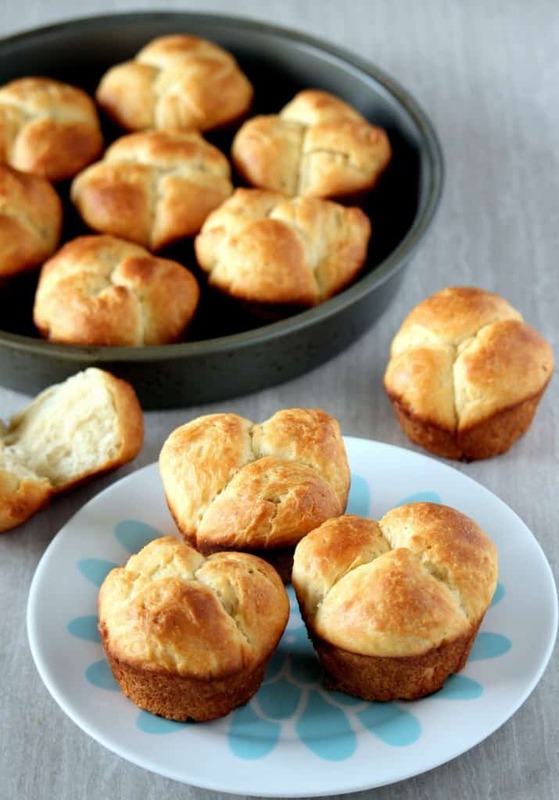 These look so easy – and I love that you broke the dough down into three balls to make it easy! I am so bad at baking bread but you make it look easy. I love all of your step by step photos! 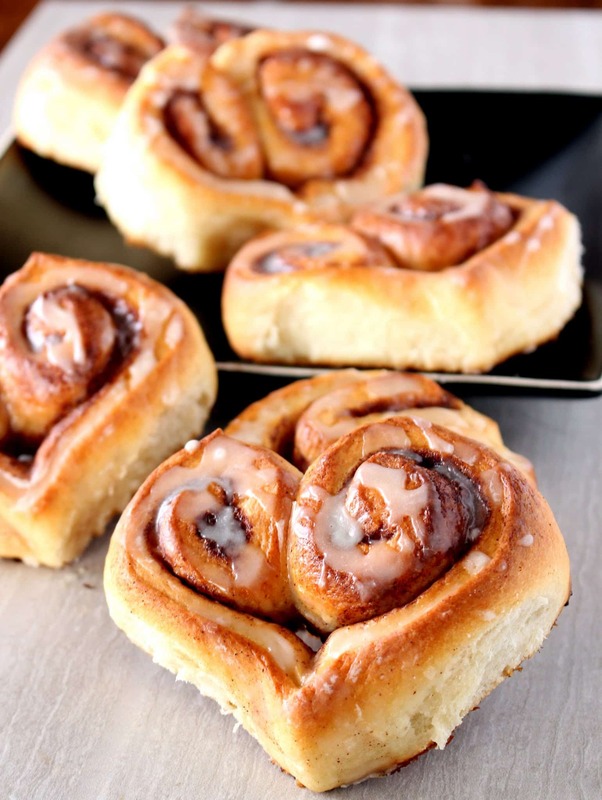 I’ll bet your house smelled so good after baking these! Thank you for sharing your experience Mackenzie! Growing uo days are so much fun and there are times when I want to go back to those simple days. 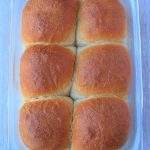 These rolls are so cute and I love how crusty they look! These would be a perfect addition to my Christmas pot roast. 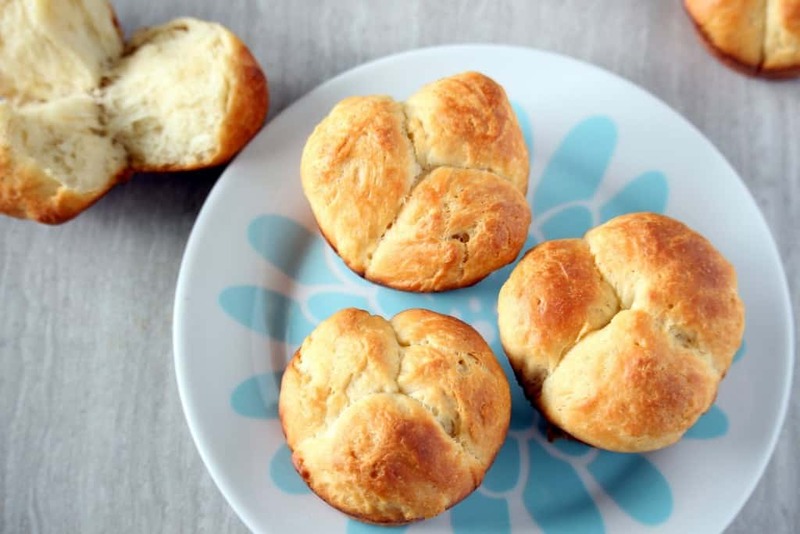 I’ve never tried making cloverleaf rolls and love the sound of a no-knead recipe! Nice step-by-step photos. I’m very happy that this was a success. With so many attempts of making bread and baguettes, this was perfect! Love it, like all the pictures, easy to understand and follow. Now, I’m going to make some soup. 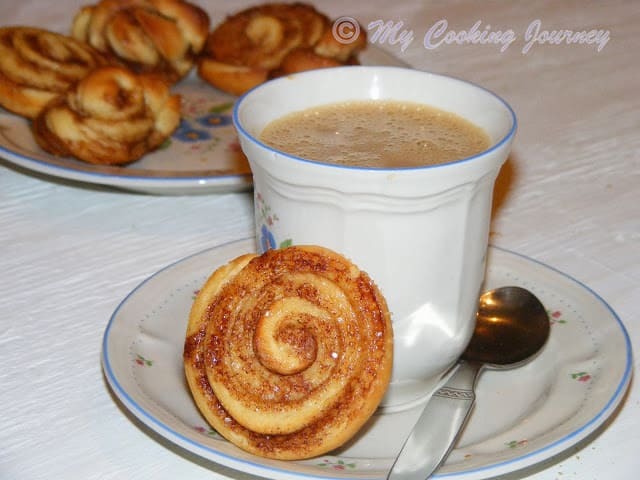 Thanks a million for your recipe. Now, I’m going to make some soup. Hi Tess, Thanks a lot for your feedback! I am so glad that the recipe worked well for you. Enjoy your dinner!